Home / MOVIE REVIEWS / "Kong: Skull Island" Movie Review: Unexpectedly Exciting, Engaging, and Thrilling! 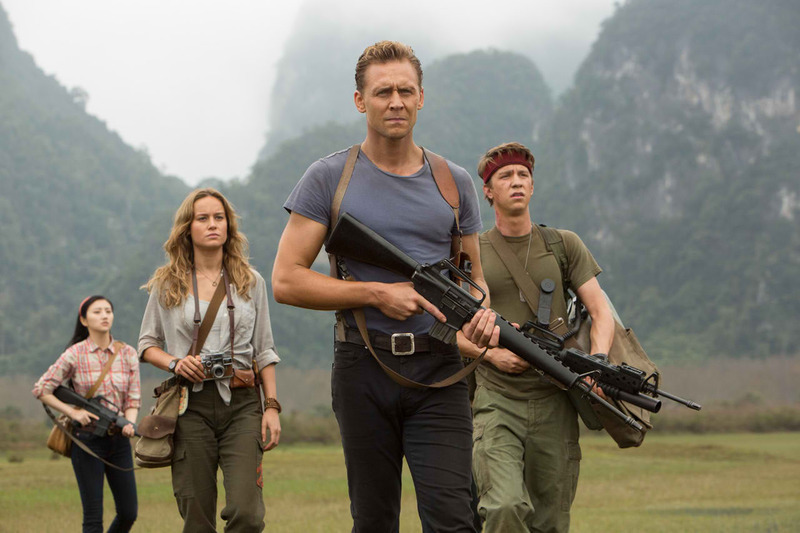 "Kong: Skull Island" Movie Review: Unexpectedly Exciting, Engaging, and Thrilling! "King Kong" or simply "Kong" is perhaps one of the well-loved destructive or misunderstood movie characters that we all love to see over and over again due to its multiple remakes and storylines dated back as early as the black and white era of the silver screen. The good thing is, every time a new "Kong" movie is released, it is being patronized by moviegoers because maybe, they see something new or fresh as they watch them. The last known "Kong" movie before this new 2017 franchise was made by "Lord of the Rings Trilogy" director Peter Jackson. At one point in that movie, we got tired, especially the chasing scene with the dinosaurs. But nevertheless, Peter Jackson's movie version is still great. In this 2017 new franchise, the big ape, "Kong" was again introduced as one of the fierce inhabitants and the "King" of the fictional South Pacific Island called, "Skull Island". Tom Hiddleston and Brie Larson graced the big screen as additional eye-candies to the already and seemingly good new movie franchise with superb cast! I must say, this year's "Kong: Skull Island" movie is the best "King Kong" movie to date! The storyline is really simple --- invaders went to an unchartered and unknown island somewhere in the Pacific and paved their way in by dropping bombs without even asking permission to the rightful owner. However, what made it great are the thrilling action scenes and the engaging story of the other characters in the film, such as that of Samuel Jackson, where he wished to "no man will be left behind". If you will stay until the end credits, you will be excited with the surprising twist that this movie has to offer, which opened to a new anticipation and expectations called the Monster Cinematic Universe or MonsterVerse that should be followed for the next 3 to 5 years. You really have to stay and watch until the end credits for you to understand what am I going through. Hahaha! As I said above, a new Monster Cinematic Universe is going to rise soon! We heard about this new monster franchise is being made starring Godzilla, himself in its most coveted role ever! This might also be an introduction to the much-awaited bout remake of "King Kong vs Godzilla"... Let's see where this will take us. For now, let us enjoy the moment that is "Kong"! Overall, we enjoyed "Kong: Skull Island" as much as the different spectators who have watched the film for its thrilling action-packed scenes, engaging plot, and exciting storyline. Great cast, believable acting, skimpy tops, and unfair Hollywood people who are blessed with such pretty faces! Hahaha! We give "Kong: Skull Island" a 10 out of 10 movie experience! We can't wait for the upcoming sequels to the Kong /Monster Cinematic Universe! "Kong: Skull Island" is still showing in Philippine cinemas. Don't forget to watch it! Enjoy!